The design for the Wei-Wu-Ying Center for the Performing Arts was inspired by the Banyan trees on site in the Wei-Wu-Ying Metropolitan Park. It will include a concert hall and an opera house and has a total capacity of 6,150 seats: a 2,000 seat Concert Hall, 2300-seat Lyric theatre, a 1250-seat Playhouse, a 450-seat Recital Hall and an open air theatre for thousands of visitors. Construction is planned this year with the theatre complex opening its doors in 2013. Mecanoo’s Fifty Two Degrees and Wei-Wu-Ying Center for the Performing Arts have been awarded the prestigious International Architecture Award 2009 by the Chicago Athenaeum Europe. Mecanoo’s design for the Wei-Wu-Ying Center for the Performing Arts in Kaohsiung, Taiwan (below) received 3rd place in the urban planning category. The complex features a concert hall, an opera house, a theatre, a black box, and an open air theatre. Hosting a total of 5,800 seats and the most technologically advanced theatre facilities, the new cultural complex will draw world class performing artists and theatre companies. 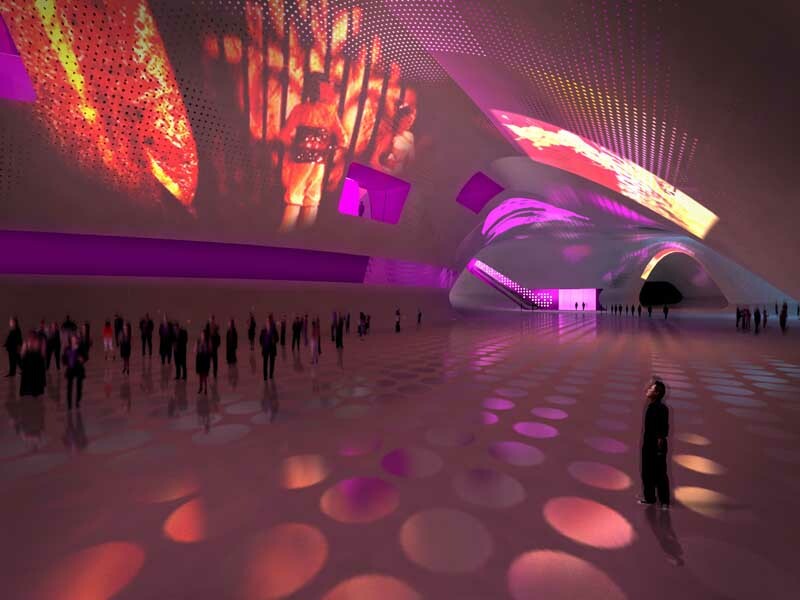 The National Performing Arts Center will become the new icon of the city of Kaohsiung. Friday March 23rd the Governor of Kaohsiung announced that Mecanoo architecten has won the design competition for the new National Performing Arts Center in Kaohsiung. At 100,000 m2 the National Performing Arts Centre is to become the largest theatre complex in Taiwan. The theatre complex will be located in the Wei-Wu-Ying Metropolitan Park and features a concert hall, an opera house, a theatre, a black box with a total of 5,800 seats and an open-air theatre suitable for thousands of visitors. The surrounding 65 ha park is part of the design brief. Francine Houben, director of Mecanoo architecten, presented the winning competition design to an international jury of architects, theatre specialists and impresarios. Mecanoo’s design was unanimously selected because of the building’s strength in expression, the integration of the complex with the park, efficient logistical planning, advanced theatre design and facility techniques and the building design’s response to the subtropical climate of the city of Kaohsiung. The building costs for the theatre complex are € 200 million, the budget of the park is not yet known. Building construction will start at the beginning of 2009, in 2012 it will be completed. The National Performing Arts Center will become the new icon of the city of Kaohsiung, the largest harbour city of Taiwan and one of the largest harbour cities in the world with 1.5 million inhabitants. By building the Performing Arts Center, the city will symbolize its evolution from a harbour city to a modern cultural city. An important source of inspiration for Mecanoo’s building design were the existing centuries-old banyan trees on location. The banyan tree is one of the world’s largest trees. The crown of the Banyan tree can grow so wide that according to legend, Alexander the Great took shelter underneath it with his entire army. Mecanoo’s building complex is 200 metres wide and 160 metres deep. Because of the openings in the roof, the passageways and open spaces, an almost porous building is created in which interior and exterior blur. The partially grass and plant covered roof creates natural and efficient building cooling in the subtropical climate. The large roof also provides an informal public space where the city residents can stroll, practice Tai Chi, mediate or just relax. Inspired by old Greek theatre, an open-air theatre was designed on the roof complex at the point where the roof dips to the ground. The surrounding park in turn becomes a stage. Zaha Hadid from London won second prize. Kiyoshi Sey Takeyama Amorphe from Tokyo, Japan became third. In total 43 international architects entered the competition. Programme: Theatre complex of 100,000 m2 with a concert hall of 2,300 seats, an opera house with 2,000 seats, a theatre hall with 1000 seats, an experimental Black Box with 500 seats, an open-air theatre and park design for 65 ha. Design: 2007. Client: Council for Cultural Affairs, Taiwan. Architect: Mecanoo architecten, Delft. Acoustic advisor: Xu Acoustique, Paris. Theatre advisor: Theateradvies, Amsterdam. Structural engineer: Arup, Amsterdam. Local architect: Hsing-Hua Lo Architects and Associates, Taipei. Building cost: € 200 million, excluding park.